Even if you’ve suffered with crooked teeth your whole life, it’s not too late to address the problem. If you’re considering orthodontic treatment, contact Cosmetic and Family Dentistry of Weatherford. We’ll walk you through your various options, provide recommendations, and help you decide if traditional orthodontics or Invisalign clear braces are right for you. We have achieved the prestigious Silver Invisalign Provider status, making our office the best place in the region to receive Invisalign clear braces. Our Weatherford, Texas dental office serves Aledo, Brock, Millsap, Springtown, Mineral Wells, and beyond, offering complete dental care and orthodontics in one convenient location. 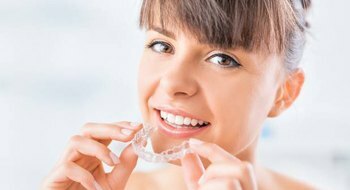 Invisalign clear braces are essentially clear plastic aligners that fit snugly over teeth to shift them into a new position. They’re very different from the metal brackets and wires that people associate with orthodontic treatment. While that kind of treatment has its place, many adults don’t want traditional braces because their appearance within the smile is very obvious and considered less attractive than natural teeth. With Invisalign, your natural teeth shine through. Also, smooth plastic doesn’t irritate soft tissues the way that metal appliances sometimes can. For busy adults and teens, Invisalign offers a time saving solution. Most cases can take less than 1 year to complete. 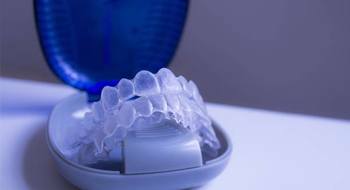 Traditional Invisalign treatment is recommended for adult patients in their mid 20s or older. These treatment plans use a series of clear, plastic aligners to gently shift teeth into the ideal alignment over the course of about twelve months. Each set of alignment trays represents the smile one step closer to the ideal alignment. You’ll wear the aligners for about two weeks. Then, simply exchange the aligners for the next set in the series. Rather than frequent office visits to adjust brackets and wires, you will simply need to attend short checkup visits in our practice every six to eight weeks in order to ensure your smile is progressing according to plan. 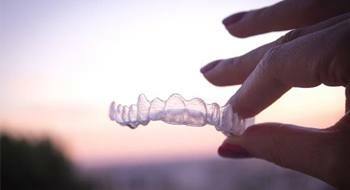 These systems offer as many as six complimentary replacement aligners because Invisalign trays on cafeteria trays often end up in the trash. There are indicators in place to allow parents and dentists to tell whether or not the teen is wearing their Invisalign trays for the necessary amount of time to achieve the desired results. Unlike traditional braces treatments that are often complicated by the teen’s growing smiles, Invisalign Teen allows the dentist to guide newly erupting teeth into alignment. Whether you choose to straighten your smile with Invisalign or traditional bracket and wire braces, you may want to consider speeding up the process with Propel. This system of accelerated orthodontic tools offers patients quicker and more comfortable tooth movement throughout their orthodontic plan. In addition to the traditional Propel Excellerator treatment to speed the orthodontic process, we also utilize the innovative VPro5 tool to help patients make the most of their Invisalign treatment plan. You’ll use the VPro5 tool at home. For about five minutes each day, the tool is placed to ensure the Invisalign trays are properly seated to ensure maximum effect. We encourage patients to complete their VPro5 therapy immediately before going to sleep. For most patients, this is the longest consecutive wear time, so the VPro5 treatment can offer maximum efficacy.